Perfect long distance call and locator. 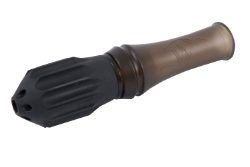 The soft, flexible barrel allows the user to control volume and back pressure by squeezing the end enabling you to produce natural sounding yips, barks, and howls. As with all of our flextone calls it is silent if accidentally coming in contact with your gun or bow.